“Always be ready to capture the moment.” One of my favorite journalism professors in college always said that. He kept a steno pad and a tiny pencil in his shirt pocket so that when the news happened, he wouldn’t waste a second finding a place to write it down. Brilliant advice that I never forgot. Now, I know a lot of great writers have written works of genius on not-so-magnificent canvasses. Bob Kauffman’s famous beat poems were found on napkins and toilet paper. Jack Kerouac famously turned hisOn The Road manuscript into his editor on a 120-foot scroll. There’s something about Abraham Lincoln putting that “Gettysburg Address” thing down on an envelope, but a quick perusal of Wikipedia, super reliable Internet source of the incurably lazy, reveals otherwise. And I heard a story once that William Carlos Williams, who was a doctor, wrote his famous poem “The Red Wheelbarrow” on the back of a prescription while waiting for a patient to recover. I don’t know if that’s true, but I like to think it is. It kind of puts the whole poem in a different light, doesn’t it? But I digress. I’m sure that worked for those guys, but these days, it’s important for a budding writer to look good while scribbling away. You want a writer’s notebook that says, “Hey! I’m intelligent, environmentally friendly, and I’m not afraid of an adorable print!” Good writing is equal parts confidence, tears, fits of hopelessness, and style. Everyone knows that. 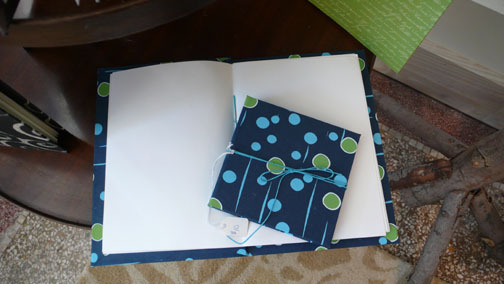 So pick up one of these chic hand-made journals for the budding writer in your family. Maybe she’ll thank you by leaving you out of the memoirs.